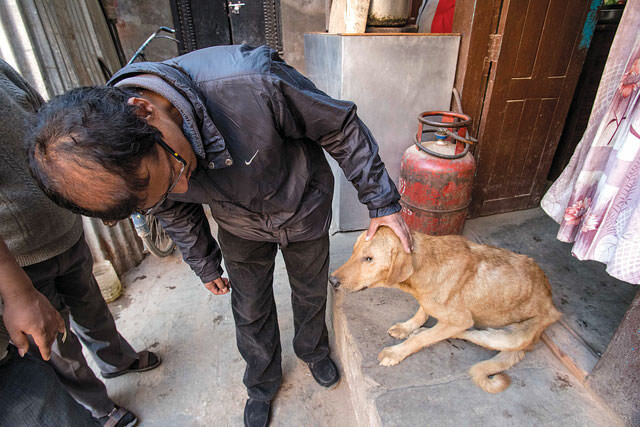 A year ago, Maru Tole restaurant owner Surendra Bajracharya got up to a rude shock: an emaciated street dog with third-degree burns was limping to his door. Someone had thrown scalding hot water at it, leaving a large patch on his left side furless. Bajracharya was so moved he started volunteering for a neighbourhood animal management program, taking in injured, malnourished dogs and giving them canine penicillin paid out of his own pocket. 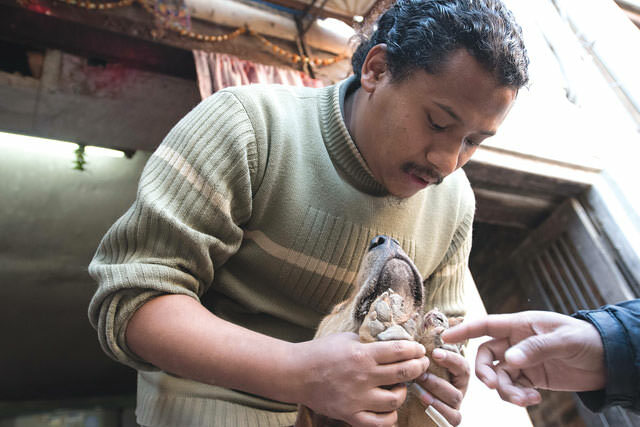 “If I had known who had thrown the boiling water on these street dogs, I would have heavily punished the person,” says Bajracharya, who blames street vendors from outside Kathmandu. For a country that celebrates the Kukur Tihar dog festival every year, the love-hate relationship between Nepalis and free-roaming street dogs is complicated. There are an estimated 40,000 dogs on Kathmandu’s streets: businesses see them as a public nuisance, they are an eyesore for tourists and considered a public health hazard. Kathmandu Metropolitan City (KMC) used to kill 10,000 dogs a year with strychnine poison, but there was no discernable reduction in population or rabies-transmission. Now, Kathmandu communities have started having serious discussions about the suffering of dogs. The term used now for street dogs is samudaik, not the derogatory bhusya (stray mongrel). Dogs in Kathmandu Ward 20. One was burnt on its left side after being hit with boiling water. “It’s a dirty word – when you cuss people we call them bhusya,” says Pramada Shah of Animal Nepal. 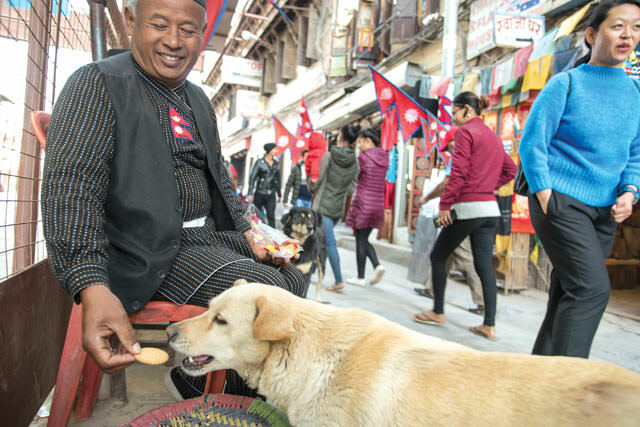 Nepali culture has always valued and respected dogs, with the violence directed towards them a recent phenomenon, and an indicator that society itself has become more violent and less cognisant of traditional Buddhist values, says Shah. After pressure from activists, KMC introduced a policy in April 2016 to help ‘manage people to manage dogs’ – which it says is a more sustainable way of keeping tabs on strays than organisations parachuting in to manage the population. The ongoing program, called ‘Manu Mitra’ (Friend of Humans), has succeeded in reducing animal cruelty and introducing the concept of animal welfare and community responsibility of street dogs. The program aims to sterilise and vaccinate all dogs in the 35 wards of the city, and have the residents themselves bear the costs. While on paper it would seem an impossible task, more dog lovers than ever before have come out of the woodwork and volunteered, unpaid, to help save their own ward’s community dogs, says coordinator Sangita Sapkota. Manu Mitra has given these canine carers the label of ‘animal management assistants’, responsible for talking to members of the community routinely on the welfare of its street dogs. Trekking guide Sunil Tuladhar tends to a sick dog near Maru Tole. 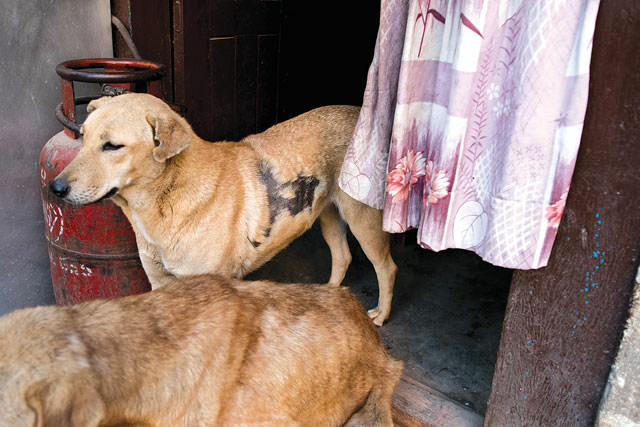 Anjali Sindurakar, an animal management assistant in Kathmandu Ward 20, says that while she previously would have been disgusted with the mange-ridden dogs, she wept once while witnessing animal cruelty. In order to instil a sense of pride about street dogs, school children have been educated on safe ownership and dog safety. This included creating a street dog mural in Shanti Nikunj school and a story competition for Grade 6 and 7 students, which resulted in The Adventures of Bhusya, where students imagine themselves as dogs of the community. Citizen policing has also toughened on criminals who don’t abide by the new standards of animal welfare and citizen responsibility. A car accident two months ago at Guna Kamdev Marg, near Chikanmugal, left a street dog injured and unable to walk. The motorist was about to leave the scene of the crime, but eyewitnesses said that butchers, shopkeepers and regular community members surrounded his vehicle, and forced him to pay a fine of Rs15,000 for injuring a dog belonging to their community. Restaurant owner Surendra Bajracharya owns three dogs of his own, but also feeds and nurses the stray dogs, including the one pictured, out of his own pocket. “This would never have happened before: they would have let the dog die. Now we feel responsible,” says Anjali Sindurakur. The money compensated was then directly used to treat the dog’s injuries. But not all street dogs are fortunate enough to enjoy the new-found warmth. Trekking guide Sunil Tuladhar says a certain proportion of street dogs in tourist areas, where there are fewer close-knit community groups, still suffer from occasional violence. Nevertheless, Manu Mitra is achieving its success of reducing the number of lactating female dogs in the area, and promises to deliver up to 80% vaccination and sterilisation rates in its wards because the community will follow up individual cases itself. Other results of educating citizens to be kinder to dogs include fewer people being bitten by dogs, and reduced cases of suspected rabies, and fewer complaints about dogs. To celebrate World Rabies Day, Ward 20 was labelled the first ‘animal managed ward’ of the city. KMC has said that it will create a registration system where dog owners and animal management assistants must mark down the birth and death of all animals, along with their owners. Any animals found without a guardian could then be traced back to their original owners, and the owners fined for abandonment. Using a smartphone app concerned citizens could scan an embedded microchip attached to an abandoned dog, linking it back to the registration system. But the project to register all dogs (and to a lesser extent, cats) will have to wait until the next fiscal year, when the government is predicted to be more stable. The state has to compensate us.